I spent a total of 19 weeks living away from family in London during 2007. Much of that time was spent by myself, and I ended up walking and exploring – the main task being to locate Banksy pieces. It really started just as something to do to keep me active and to soak up the essence of a different city. Armed with a Banksy Walking Guide that I bought on eBay, I set out on a number of days and walked for miles, finding many stencils around the East End. Some had been buffed; some were hidden behind fences; some just sitting there just like the picture in the book. Oddly, you could even recognise others who were doing a similar thing and conversations started as you pointed someone to an obscure Banksy that they had missed – a temporary camaraderie in a strange city! Subsequently, I have also found a few Banksy stencils locally in Melbourne, funnily most are just in the streets around my home and on shop fronts that I walk past each day. 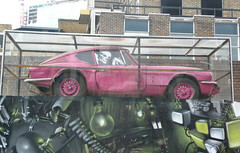 Today I’ve just posted the last of my Banksy photos to Flickr – Banksy’s skeleton car on display behind the Old Truman Brewery back in November 2007 – not sure about it’s current status. You can see all my Banksy collection in an online set, Going on a Banksy Hunt if you are so inclined.